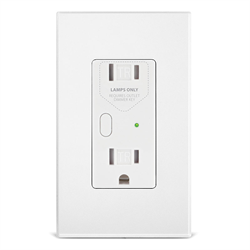 The INSTEON Dual Band OutletLinc Dimmer installs like a standard wall outlet and has a 300W dimmable outlet built in with tamper resistant slots to conform to new building codes. The top outlet is controlled and the bottom is always on. As a dual band device this product has a built-in Insteon wireless access point that functions as a wired and wireless repeater and wireless receiver. 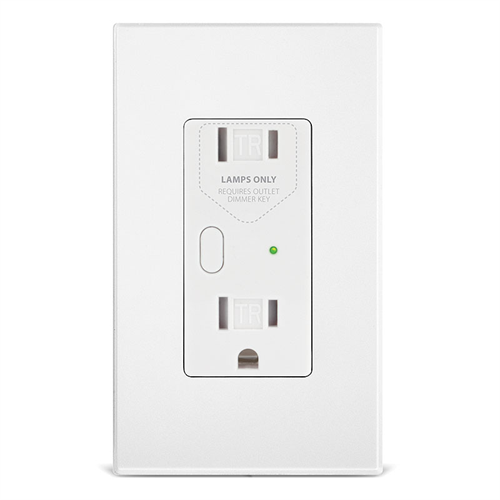 The OutletLinc dimmer can be directly controlled by an Insteon wireless remote or other standard Insteon controllers. For safety, a dimmer-key is attached to the lamp you wish to plug-in to the OutletLinc's dimming outlet. This super slim piece ensures that no-one plugs anything but your lamp into the OutletLinc's controlled outlet. Other safety features include overheating protection.